Dan “The Man” Houser brings you Hero Pack 5 for ICONS Superpowered Roleplaying, now available on DriveThruRPG and RPGNow! 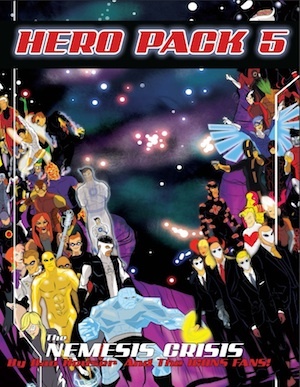 Like previous entries in the popular Hero Pack series, this one features dozens of fan-created heroes and villains, by ICONS players for ICONS players, with a twist: characters are paired, hero with arch-nemesis, hero team versus villain team, with three pairs of solo hero/villain enemies and seven pairs of teams (fourteen total) as arch-foes, all ready to use in your ICONS game! Plus the characters in Hero Pack 5 use the updated power descriptions and formats from the Great Power sourcebook, making it immediately useful with those rules. Grab a pack of inspiration for your ICONS game with Hero Pack 5! Get it now at DriveThruRPG! The six abilities in Icons are ripped off from an homage to Marvel Super-Heroes, minus the somewhat superfluous Endurance (the “E” in FASERIP), which got combined with Strength, so you’ve got Prowess (Fighting), Coordination (Agility), Strength (duh… Strength), Intellect (Reason), Awareness (Intuition) and Willpower (Psyche). But was Endurance the only superfluous ability to remove from the mix? Maybe, maybe not. The Prowess/Coordination split largely de-emphasizes Coordination as the sole ability for physical actions, but Prowess is the ability voted Most Liked to Be Considered a Skill. Mutants & Masterminds 3e has a somewhat similar split (between Agility and Dexterity) but both are more raw “abilities” with combat skill for either handled by… well, combat skills. Prowess does allow for the higher-Prowess, lower-Coordination character, but so do the appropriate combat specialties. Are there many characters likely to have more than three levels of difference (a Master bonus) between their Coordination and fighting ability? There’s certainly a case to be made for taking Prowess out of the mix and folding its uses into Coordination. Coordination and Strength are pretty safe: one is the overall physical “action” ability and the other is the overall physical “effect” ability. Likewise, Intellect and Willpower are pretty safe. Sure, you could collapse all of the mental abilities into a single one like “Mind” (and some systems do) but there seems to be some benefit to differentiating between a character’s smarts and force of personality. Some have more of one than the other, while others have both. Awareness exists largely to divorce a character’s ability to notice things from either Intellect or (even less obviously) Willpower. One of the oddities of the Marvel Superhero Adventure Game (aka “Marvel SAGA”) was assigning sensory powers and tests to the Willpower ability. Personally, I blame Mr. Fantastic, who is often portrayed as the classic absent-minded professor: brilliant, but somewhat oblivious. However, while Reed Richards might not pick up of a lot of social cues, he’s plenty sharp when it comes to noticing things where it counts. Likewise, Brainiac 5 of the Legion of Super-Heroes tends to get wrapped up in his thoughts (and ignores some social niceties) but he still sees patterns and clues well enough. Do we need Awareness, or is Intellect—modified by specialties and occasionally limited by challenges—enough? For that matter, do we need abilities at all? A number of RPGs—including many versions of FATE, A Song of Ice & Fire Roleplaying, and Marvel Heroic Roleplaying—do away with traditional “ability scores”. Characters have ratings in certain things they are notably good or bad at but, otherwise, a kind of background default is assumed (and left unspecified). Icons could likewise skip assigning any abilities at all unless they’re notably above or below average, like a scale of 1, 5, 7, and 9, for example (or 2, 4, 6, 8, and 10, for slightly more options). Speaking of the scale, some find the 3–6 range of “normal human” too limiting (technically, it’s 1–6 for normal human, including both of the below average levels). Is three levels for the full range of human achievement above “average” sufficient? For a superhero RPG, probably, since most super-types who are “above average” are often way above average. If anything, three levels may be too many in that regard. Of course, we have to keep in mind two things: First, that many “normal humans” in the comics do have superhuman abilities. Chances are good that Reed Richard’s Intellect and Hal Jordan’s Willpower are higher than 6 in Icons terms. Second, even if that’s not the case, specialties even things out. Batman may (arguably) have “only” a 6 Intellect, but he’s also a Criminology Master, raising his ability to the high superhuman range even before his “Dark Knight Detective” quality comes into play. Captain America may “only” have a 6 Prowess, but he’s a Martial Arts Master, making him a superhuman fighter. In fact, the Determination system is set up to reward characters like this, since specialties are not included into the calculations for starting Determination. A hero with “only” human-maximum abilities and a lot of specialties can also have more Determination, as the aforementioned characters do. Paring down the Icons abilities to just four (Coordination, Strength, Intellect, and Willpower) does have some appeal: a nice 2-by-2 “grid” of Physical and Mental abilities (Coordination & Strength/Intellect & Willpower) and Action and Effect abilities (Coordination & Intellect/Strength & Willpower). 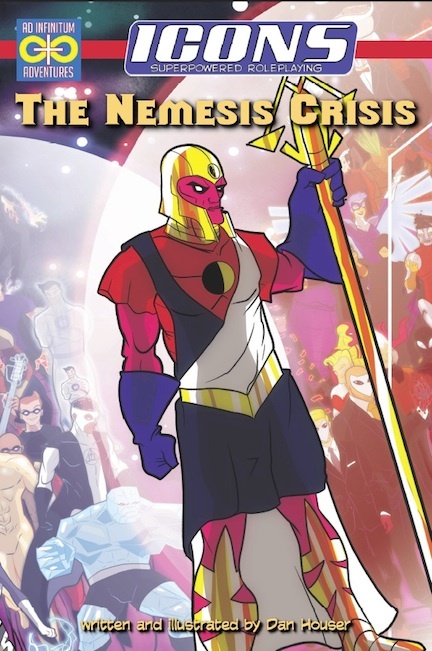 Plus it is a rip off of an homage to the Marvel Super-Heroes Adventure Game. On the other hand, we lose having the same number of abilities as sides on the die, which made some things easier (largely on the random tables). Got a take on abilities in Icons? Feel free to drop me a line and tell me about it!